We all love doing something “for charridy mate”, not aarf! But of late, never a month seems to go by without beer or alcohol in general getting a bit of a bashing as a tool for doing so. People are encouraged to abstain from their favourite beverage for a month with events like #Dryathlon, #DryJanuary, #GoSoberForOctober, and “Don’t Go On A Bender In November” (OK, maybe I made the last one up), with a view to being sponsored for doing so to raise money for some excellent charities. I have no problem with that in principle, and with MacMillan Cancer Support especially in mind as being very close to my heart, clearly wholeheartedly approve. But, this constant use of beer as a fundraising tool, must impact on the industry, especially with smaller businesses. I think is beginning to lose its impact through overuse, which is where this idea came from. With this in mind, I got chatting to Steve over at the Beer O’Clock Show this morning. He liked the idea; and from that spark, fanned by his MASSIVE enthusiasm, it grew and the event was born in a few hours. Steve quickly set up the Just Giving page and has written his own post here. Clearly out aim is not to go out against MacMillan or anyone else, so with that in mind we decided on a date that coincides with their “Worlds Biggest Coffee Morning” that being Friday 25th September 2015 to host our own way of supporting the cause. So after you have had your coffee and cake fix, you can sit back and wait to enjoy “Big Beery Night”. The basic idea is this. You have a drink (or drinks) on Friday evening, and post pictures of your beer, or you AND your beer, using the hashtag #BigBeeryNight. This is then your pledge to then donate the equivalent cost of your beer(s) to our Just Giving page. We have set a target of just £1000, but with your help we hope to absolutely smash that! 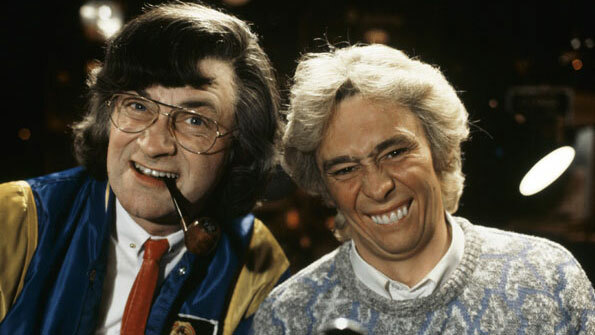 Well, obviously, join in, have a beer or two, post your pictures to twitter, Facebook or whatever. Use the #BigBeeryNight and donate to the page. Bloggers and beer writers, write your own posts, share the love, get the message out there that beer drinkers care too, lets smash this target together. Host a bottle share, with a kitty for beers thrown in. Untappd badge fines, for some top-level badgewankery. Here’s that date for your diaries again. Let me put this straight from the outset the Titanic Charity Pub Crawl as it was officially known, was no afternoon stroll, trotting around a few pubs getting slaughtered in the name of charity. It was a bloody long slog, in truly awful conditions and without trying to be over dramatic, for me at least the hardest test of endurance I have ever completed. The day started with an event that we hoped was not a bad omen. At 8.20am as we were just about to leave Rach and I heard a loud bang. We looked outside to see a rather scruffy looking dazed pigeon on the decking which of course was attracting an excited reaction from Maggie our Jack Russell. We stepped outside and carefully moved it to a safe place to see if it would recover and fly off, it didn’t, we looked again and in the five minutes that had passed, the poor bird had died, presumably from internal injuries as it left a large pool of blood which leaked from it’s lifeless beak. Sad but also bloody awful timing as I had to clear it all up and move the carcass before we left for Stafford. Our merry band left Stafford in good spirits and with a change of route, taking the lead from a local boy who knew a “better route” (no names mentioned Dave) that would avoid walking along the main roads. It certainly did, we hiked across several very muddy fields, clambering over multiple stiles of sometimes very odd design, on top of which in true British August Bank Holiday fashion, the heavens opened sporadically to soak, then lull you before soaking again and that was the easy bit. After the farm it was only a short yomp through a couple of fields to the sanctity of the canal towpath which was to form the rest of our long meandering route to Stone. Sadly though it was not to be, the fields led ultimately to a triangular end point, at the end of which was a rather inquisitive bull, an inquisitive bull with 12 inch horns… More choices, track back and find another route or face Bully! Oddly half of the group chose the bovine option and the other including myself turned around and went back the other way. That alternative route was not a good one, we had to traverse 5 three band electrical fences, so no way under, it was over the top or nothing. Sadly the smallest of our band was only around five foot six, with a corresponding inside leg measurement. He got it both barrels, zapped where no man deserves to be zapped, not once, but THREE times! The last of which ending in him falling over in a frantic effort to get off leaving one foot buzzing away on the fence..
At last though we reached our final triple electric and barbed wire fence combo, three fences in the space of around five feet which shall we say was, “interesting”. So what of our compradres in the bull fighting section?? Sadly it wasn’t THE Greyhound and the end of our walk, it was the pub which sat on the canal side, a milestone at least as it meant no more treacherous walking conditions. It was incredible, we were hit by hurricane Irene’s twin sister Pollys (think about it), a torrential downpour of truly unbelievable proportions. Heavy rain, quarter inch hailstones and it followed us for miles and dreary trudging miles. The already pot holed tow path turned into a series of mini muddy lakes, waterproofs were futile as was any previously decent footwear, all of us were well and truly drenched from head to tow including the now extremely dishevelled looking Maggie Jack Russell..
To add insult to flipping incredibly annoying injury the path we were taking had a country road running in parallel, consequently we were then being hit by a tsunami of wash from each passing car. I’m not talking a splash here, think a stormy Blackpool sea front soaking, side on.. August, nuff said…? So there it was, after a Foriegn Legionesque 9 mile plus assault course, which in truth should have been 7 miles steady walking, we reached our first checkpoint, The Royal Exchange. The beer choice was easy for me, Dark Star Hophead, light hoppy and refreshing served up with a large plate of freshly cooked chips and soft white bread, a welcome tonic after what had been a bit of an ordeal. To give you an update we have raised £1,374.50 to date. A Just Giving page has been set up for the walk. It can be accessed online at http://www.justgiving.com/titanicgreyhound. Alternatively, donations can be made in person at the Greyhound or by phone – text GHTB67 followed by £1, £2, £3, £4, £5 or £10 (eg. GHTB67 £3) to 70070. For the hardened walkers out there 23 miles may not seem far, especially with a few pub breaks in between, but believe me for myself and many of the walkers Saturday is going to be a long hard slog. It’s been a busy old week, but finally I think the preparations are complete, I’m kitted out with worn in walking shoes, wet weather gear, drinks, energy bars and have my trusty tankard at the ready. Maggie, my four legged walking companion has had a health check at the V.E.T‘s and passed with flying colours, she completed a ten mile test walk in the week too and was in all honesty in a considerably better state than I was at the end of it…. Donations are going really well, considering we have only been actively promoting this for about ten days. As I write this we are currently at £899.30 and are hoping to smash £1000 and well beyond, for that though we still need your support. I will be Tweeting and posting photographs of our progress throughout the day, starting at 9am in Stafford, you can follow us on #TitanicGreyhound and on Facebook. Calling all pub walkers, beer lovers, bloggers, brewers, retailers & drinkers, friends, family and even dog lovers too, I need your help. 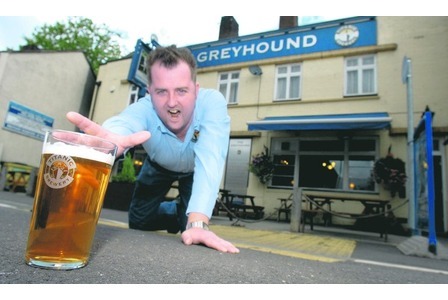 A good friend of mine Lee Farrington, landlord of The Greyhound, in Hartshill Road, Newcastle – Under – Lyme, is encouraging friends and pub-goers to join him on a 23-mile pub crawl between Titanic Brewery’s five inns. 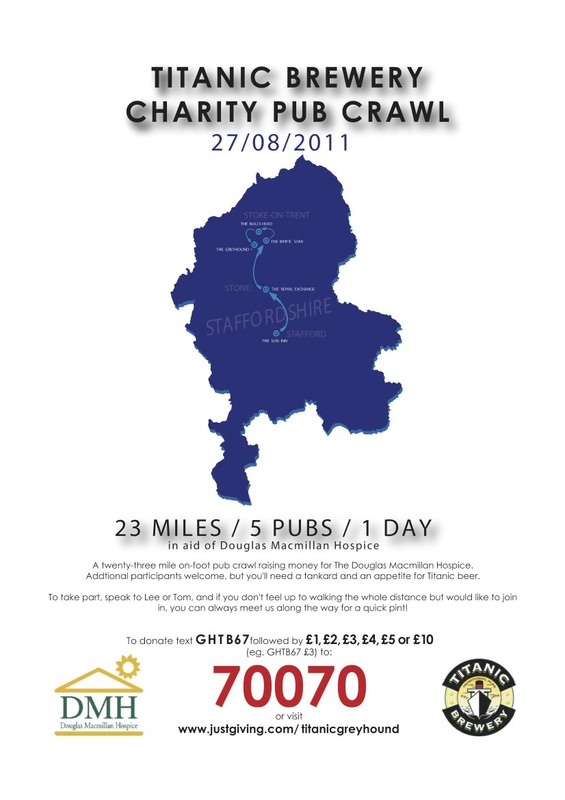 The pub crawl will wind it’s way slowly 23 miles north from Stafford in South Staffordshire, calling at each of the Titanic Pubs on the way. So starting at The Sun in Stafford town centre, it will call at The Royal Exchange, in Stone, The White Star, in Stoke, The Bulls Head, in Burslem and finishing at The Greyhound. I myself, as I am sure many of you will have too, have had friends and relatives who have been helped at a time of real need by the great work done by the Douglas Macmillan Hospice and so not being one to turn down a challenge (especially involving beer) I duly signed up…. I will be joined by my trusty dog Maggie, we both know it’s not going to be easy, 23 miles is a long way despite the refreshment stops. 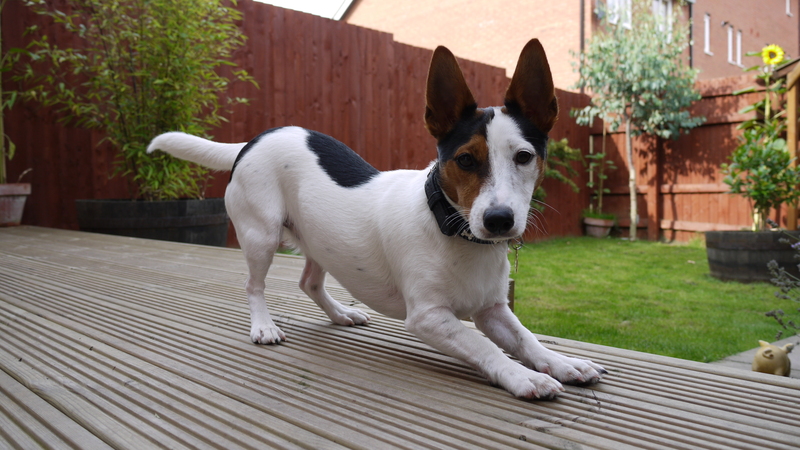 Besides that, one of us only has short fat hairy legs, is not particularly fit and the other is a little Jack Russell! Well all walkers are welcome to join in, either for the full march or to join and leave Lee & his merry band as you can along the route. For details please contact me directly or speak to Lee at The Greyhound. Most of all though we want your support in terms of sponsorship, if you can donate even the smallest amount it will all mount up. Also please spread the word, between you all with your influence we can reach thousands of people if you share this. So please share this by emailing it to your friends, post it on your blogs, Facebook pages and Twitter feeds. We will all have individual sponsorship forms too, so collar me if you see me or any of us in the pub. Of course if you have any other ideas of ways to raise money on the day I’d be glad to hear them, just drop me a line. When you do donate, please leave a message, it would be great to see your messages of support. Please give generously, it’s all for a VERY WORTHY CAUSE.